Mace River Ranch is a new home community in Eagle, Idaho. The 192-acre master-planned community is ideally located along the Boise River and adjacent to downtown Eagle. If you’ve been looking for a beautiful riverfront or waterfront setting to buy or build your ideal home, this is it. As much as there is to do just outside Mace River Ranch, there’s plenty to keep you busy within. Starting with a spacious clubhouse and pool, you’ll enjoy a gracious combination of community features and amenities, including a beautiful 40-acre nature preserve. More about Mace River Ranch real estate. Explore our extensive guide to new Eagle subdivisions. Or browse all new homes in Eagle by neighborhood, price, builder and more. 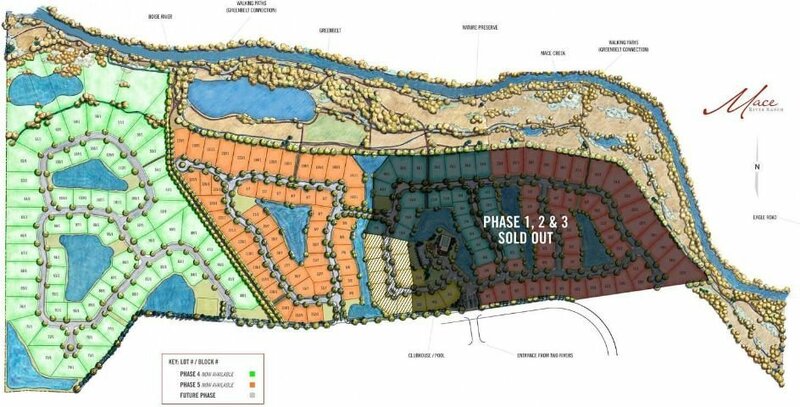 Homesites: Only a few lots for sale remain in Phase 5 (gated section). Mace River Ranch real estate covers 192 acres and offers 218 building lots ranging in size from 0.25 acres (10,890 Sq Ft) to 3.09 acres (134,600 Sq Ft). Mace River Ranch homes for sale are located on the east side of Eagle Island along Mace Road. Situated along the river just southwest of Eagle Road and State Street. From State St. (Highway 44) head South on N. Eagle Rd. Turn right (west) on Mace Rd. Let one of our new construction experts help you find the perfect home for sale in Mace River Ranch. Contact us online or call (208) 391-4466.